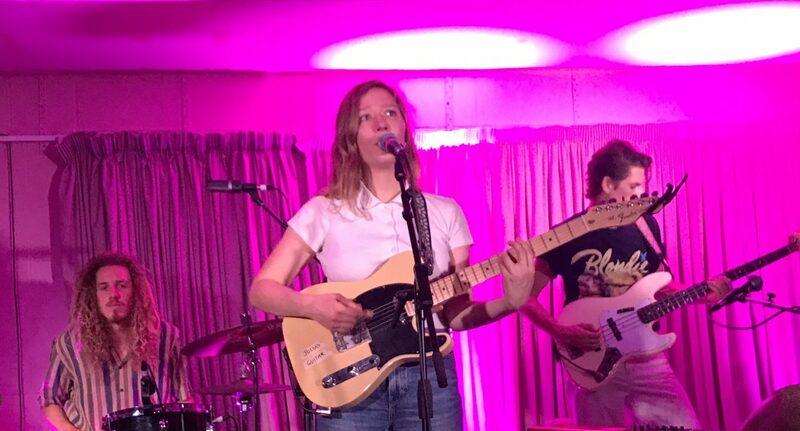 Julia Jacklin graced the stage in the Pink Room at Yes with incredible vocals and beautiful new music. Her new album, Crushing, is the story of a traumatic breakup and carries a lot of pain and emotion. It was interesting to hear how this would be played out on stage, and whether there would be a sadder atmosphere in the crowd. However, Julia Jacklin proved that she is more than the heartbreak of her last album, bringing laughter, sadness and fun facts about cities across the UK. The setlist for the show was clearly thought through well. She managed to get through the whole of her new album Crushing whilst still playing a good number of songs from her debut album ‘Don’t Let the Kids Win’. This meant there was something for all fans, both new and old, and the flow of the setlist worked surprisingly well. It was also impressive to see how most of the people in the crowd had clearly seen her multiple times, calling out to her periodically throughout the show to mention the last venues they saw her play at. The recorded vocals on Julia Jacklin’s music are pretty impressive, but so often artists who record well don’t manage to sound as good live, and the backing instrumentals sometimes carry the vocals. However, Julia’s vocals seemed to be even better live. Her vibrato when hitting her softer high notes was incredible to hear, for example in the song ‘Convention,’ but in her punchier songs like ‘Pressure to Party’ and ‘Don’t Know How to Keep Loving You’, she still managed energetic and gutsy vocals. From the high notes in ‘Turn Me Down’ to the deep tones in ‘Don’t Let the Kids Win’ she really has an incredible vocal range and one that was, surprisingly, even better live. Julia also brought a subtle comedy to the show, talking to the crowd about her gig in Birmingham the night before were she learnt that Birmingham as a city is the largest producers of pens in the world. A few fun facts about Manchester were shouted out from the crowd, and it was really nice to see an artist take a genuine interest in the city their gigging in and want to talk to local fans. Although she didn’t seem quite understand the relevance of bees in Manchester. A really nice moment in the gig was when Julia played ‘When the family flies in’. All the emotion and pain that led to this album reaped out of her and onto the audience. Her vibrato filled the room and seemed to encompass the crowd, who were hanging onto her every note. It was a really special moment and the way she projected her hurt to the crowd was really impressive. The epitome of Julia Jacklin has to be her guitar, which was glued to her the whole gig. On her guitar was two lines of tape, written in sharpie on which were ‘JULIAS GUITAR’ and ‘YOU GOT THIS!!’. The latter seemed to show just how down to earth and normal Julia Jacklin is, that despite the success of her recent heartbreak album, that heartbreak is still carried within her and she needs small pick-ups every day, just like the rest of us. Julia Jacklin seems to be the diamond in the currently over-saturated rough of the indie music scene, and definitely deserves more praise and attention than she is getting. Leading the growing Australian music scene and making a stamp as a female empowering singer, Julia Jacklin is a breath of fresh air. Don’t miss Julia Jacklin perform at this year’s Greenman Festival 15th-18th August alongside some of the industry’s hottest alternative acts!